Since my shoulder surgery 4 weeks ago, I've been spending a lot of time developing software and listening to Pandora. The pain meds (oxycodone & hydrocodone) put me in a bit of a brain fog, limiting the effective breadth and depth of my thinking (and doing), but a reasonably well-defined coding task seemed ideally suited to my power of concentration ... and I've always found listening to music while coding helps put & keep me in "the zone". The Pandora fremium online music service has developed such an accurate model of my preferences over the past few weeks that I've upgraded to Pandora One. The annual subscription version of the service has eliminated commercials and increased the length of time I can listen per day, and eliminates the pause and prompt asking "Are you still listening?" if I don't interact regularly with the site. I'm probably dating myself with these examples, and by my uncertainty about whether contemporary bands are producing songs that are intended to flow so naturally from one to the other. Perhaps it was solely or primarily a trend of the late 60s and early 70s. I'll update the list with additional examples as I encounter them, and would welcome any other examples anyone is inclined to share in the comments. I've always been impressed with the incredible range of Joni Mitchell's music - her voice, guitar virtuosity and the different genres she has explored - but after watching a documentary about her life and work, I have a whole new level of appreciation. In fact, I watched the video - Joni Mitchell, Woman of Heart and Mind: A Life Story - three times in two days ... and see many other parallels with another inspiring video I watched three times in two days: Brene Brown's TEDxHouston talk on wholeheartedness: connection through courage, vulnerability and authenticity. I've been experiencing a long series of dark nights of the soul recently, and so am perhaps even more drawn toward - and inspired by - expressions of courage, vulnerability and authenticity than I might be under normal conditions ... whatever normal might be (or become) at this point. I don't seem to be able - or willing - to muster the gumption to delve very deeply into my own darkness at the moment, and so will continue hovering near that edge while sharing some notes on others who are more willing to reveal (and release) their shadows. Although as a painter I had the need to innovate, as a musician it was just a hobby. I didn't think I had the gift to take it any further than that. "Just a hobby" - wow! I lost my virginity and got pregnant, and entered onto the "bad girls" trail, which was a trail of shame and scandal, and I had to kinda hide myself away ... I was living a lie, and felt like I'd been betrayed ...It was very difficult for me, and so I began to write. I think I started writing just to develop my own private world, and also because I was disturbed ... I feel, every bit of trouble I went through, I'm grateful for ... Bad fortune changed the course of my destiny. I became a musician. She sang it so real, so true, as if she was singing for me. She was my voice, you know? She was everybody's voice. She was like a universal voice. ... She lives with a great respect for this mystery, and with an openness, inviting this mystery. This is her great strength. Because I think it requires tremendous strength to really believe in something that you cannot put your finger on. During the making of Blue, I was just so thin-skinned and delicate, that if anybody looked at me I'd burst into tears. I was so vulnerable and I felt so naked in my work. 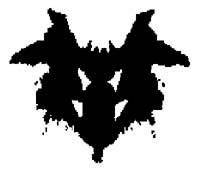 My individual psychological descent coincided, ironically, with my ascent into the public eye. They were putting me on a pedestal and I was wobbling. So I took it upon myself, since I was a public voice, and was subject to this kind of weird worship, that they should know who they were worshiping. I was demanding of myself a deeper and greater honesty. More and more revelation in my work, in order to give it back to the people, where it nourishes them and changes their direction, and makes light bulbs go off in their head, and makes them feel, and it isn't vague, it strikes against the very nerves of their life. In order to do that, you have to strike against the very nerves of your own. Any time I make a record, it's followed by a painting period. It's good crop rotation. I keep the creative juices going by switching from one to the other, so that when the music or the writing dries up, I paint. You rest the ear a while and you rest the inner mind, because poetry takes a lot of plumbing the depths. I mean, the way I write, anyway, it takes a lot of meditation. Without the painting to clear the head, I don't think I could do it. The writing has been an exercise, trying to work my way towards clarity. Get out the pen, and face the beast yourself and what's bothering you and write. Well that's not exactly it. Well OK, let's go a little deeper. Well that's not exactly it. It's very hard, peeling the layers off your own onion. When you get to the truth, well do I want to say that in public? So you're really doing a tightrope walk to keep your heart alive, to keep your art alive, to keep it vital and useful to others. This is now useful because we've hit upon a human truth. It's been a very kind of subjective, I guess you'd say, journey. Subjective but, hopefully, universal. That was always my optimism - that if I described my own changes through whatever the decade was throwing at us, that there were others like me. And it turns out that there were. 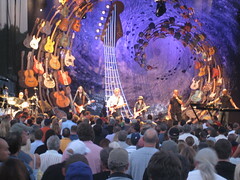 We saw Steve Miller Band in our first concert of the 2010 summer season at Chateau Ste. Michelle on Wednesday night. CSM summer concerts tend to include a preponderance of rock stars from the 60s and 70s, some of whom are looking, sounding and performing better than others, so many decades after their heydays. 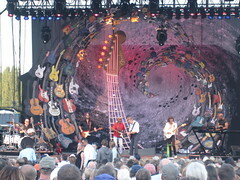 Steve Miller is definitely one of those who is still faring well after all these years. His voice, guitar playing and showmanship are still going strong, and he had a good band - and a number of special guest stars - to accompany him. He played one long set, with one encore in which he responded to audience requests. Despite our efforts to get him to play Your Saving Grace, he responded to louder requests for Jungle Love (or, as at least one particularly loud requester was referring to it, "Chug-a-lug"). Surprisingly to me, throughout most of the concert, the keyboardist also provided the bass lines. The backup guitarist played bass guitar on a few songs, but it was mostly keyboards throughout (not that I would have noticed if I hadn't seen the players assembled on stage). As is so often the case at these oldies but goodies (and not so goodies) concerts at CSM, I think SMB could have provided far more opportunities for audience sing-alongs. He did invite us all to sing the refrain during Space Cowboy, but I'm often surprised at how little beloved musicians are willing to engage their long-time fans in a more participatory experience ... especially fans like me who used to play his songs in an amateur rock band years ago. I'm sure the music quality is higher with the professionals performing, but I suspect the people known as the "audience" would welcome more opportunities to share more prominently in the music-making. 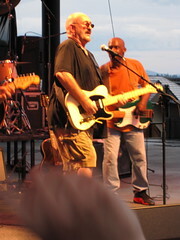 Gerald Johnson (bass), a former member of the Steve Miller Band, and Randy Hansen (guitar), a local Jimi Hendrix cover artist, joining the band for some cover songs by Eric Clapton, Jimi Hendrix, Slim Harpo and Muddy Waters - shown in the image at the top. Dillon Brown, a young (high-school age) guitarist from the Kids Rock Free program who joined the band for several numbers toward the end - shown in the image at the right. Update, 2010-07-27: Just read about ThingLink's photo tagging service; trying it out on a larger version of the first photo above. Mouse over / click on people in the image to see who's who. 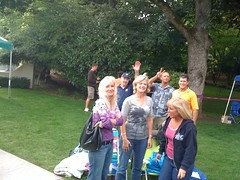 We saw Jackson Browne in concert at Chateau Ste. Michelle last night. The Rock and Roll Hall of Famer and his fellow musicians gave a crisp, clean performance of many familiar songs on an unseasonably cool evening at the winery. Of all the concerts I've seen at the winery - nearly all of which are by musicians who first gained fame in the 60s and 70s - Jackson Browne, now 60, looked and sounded the strongest. The band played and sang well together, the sound was perfectly mixed (nothing was too loud or too soft), and - unlike the recent Dave Mason concert at CSM - there was plenty of banter with the audience. The aspect that most stood out for Amy and me - and other friends who were with us - was the outstanding vocals provided by Chavonne Morris and Alethea Mills. They were seated on stools in the background throughout most of the first set, mostly providing background vocals for the songs; at one point, Amy - always attuned to vocals and vocalists - turned to me and asked "when is he going to let them cut loose?" Well, we didn't have to wait long. In the second set, they were on their feet, and their solos during the third song, "About my imagination", really opened things up. Their solos in the next song, "Lives in the Balance", kept the momentum building throughout the set. While the women, who joined the group fairly recently, were the standouts, the rest of the band, who have been playing with Browne since 1993 - Kevin McCormick (bass), Mark Goldenberg (guitars), Mauricio Lewak (drums) and Jeff Young (keyboards, backing vocals) - were all [also] outstanding. The bass player is also the producer, and I wondered how much his involvement on stage influenced the incredibly balanced sound mix we were treated to during the show. Another highlight was the guitarist's use of what my friend Bruce said was a 11-string fretless guitar that provided an eastern sound during "Lives in the Balance" (by the time the binoculars got back down to me, the song had ended). Other highlights included the last song of the first set, a rocking rendition of the classic song, "Take it Easy", which [I didn't previously know] Jackson Browne co-wrote with Glenn Frey of the Eagles, the band that popularized the song, making it one of The Rock and Roll Hall of Fame's 500 Songs that Shaped Rock and Roll (Browne's own performance of another song, Late for the Sky, is also on that list). And, of course, the most classic encore song of all time, Stay, was great to see live as the second and final encore. We are very fortunate to have good friends - Bruce, Jay and others (pictured on the right) - who were willing to go to the winery early and reserve a spot in line. I've been asked not to reveal how early they got there, but it was sufficiently early that we were the first in line - at the main gate - to vie for the lawn seats. Unfortunately, they opened up the south gate a minute or so before the main gate, and so we didn't get the front "row" on the lawn, but we were right in the center in the second and third rows, which gave us a fabulous vantage point from which to watch the concert. Dave Mason has lost some hair and gained some weight, but he still sounds strong after all these years. Chateau Ste. Michelle hosts a lot of concerts by older rockers, and some of them are aging better than others. I've been disappointed with a few of the concerts I've seen there over the years (e.g., James Taylor and Crosby, Stills & Nash), but the show by Dave Mason last night - a special Vintage Reserve Club Member Appreciation Concert (for people who are members of the CSM wine club) - was one of the best. Most of the songs he and his band played in the single set (plus one encore) were classics from the early 70s - for which he was inducted into the Rock & Roll Hall of Fame in 2004, along with the other co-founders of the band, Traffic - but he included three songs from his relatively new album (26 Letters, 12 Notes) that were also quite good ... in fact, they were probably the best new songs from an old rocker I've heard at any concert at the winery. Mason was joined on stage by bassist Gerald Johnson, guitarist Johnne Sambataro, drummer Alvino Bennett and keyboardist Tony Patler. The group had lots of energy, great rhythm and good harmony. We were in front of the stage for much of the show, right in front of the speakers, so the solid beat laid down by the bassist and drummer gave us some good vibes. Shortly after the show began, it started raining, and about half way through it started raining pretty hard. Fortunately, the performers were shielded from the precipitation - as were those of us who had moved up early to enjoy the show directly in front of the stage - and they kept right on playing. In fact, I don't even remember them saying anything about the weather. Come to think of it, I don't recall them saying much about anything (including the songs they were playing). I suppose that may reflect the one criticism I have of the show. As with the Chicago concert we saw at CSM two years ago, I noticed that lots of people (including me) were singing along to nearly all the songs, and yet unlike that concert, the band never stopped singing to invite the audience to participate more fully in a sing-along. Feelin' Alright, in particular, represented a big missed opportunity for letting us bellow out a well-loved chorus ... all the more ironic given that Dave Mason was the one who wrote the lyrics for the Traffic song, You Can Join In. As usual, I was taking notes of the songs during the show, but unfortunately, despite staying mostly dry, the ink on my page of notes ran, so this list does not represent a complete set. Also, I didn't recognize any of the three new songs he played, as it was the first time I've heard them, so they are not listed here. The speeches of the two U.S. presidential candidates Tuesday night were hopeful and inspiring, a welcome change from the fears and smears that dominated much of the campaign ... or, at least, one side of the campaign. John McCain delivered the most gracious concession speech I have ever seen, and Barack Obama delivered yet another inspiring - and gracious - victory speech shortly thereafter. I had planned to post a blog entry summarizing some of the fears and smears promulgated by McCain, his running mate Sarah Palin, Fox News and other conservative voices - instances I'd been tracking via Twitter - after the election, but the combined positive boost of these two speeches leads me to let these go, and focus instead on hope and dreams. And, in letting go of fears and embracing hope and dreams, I'm reminded of a classic book by Gerald Jampolsky, Love is Letting Go of Fear, which I first read many years ago. The Course [in Miracles] states there are only two emotions, love and fear. The first is our natural inheritance, the other our mind manufactures. The Course suggests that we can learn to let go of fear by practicing forgiveness and seeing everyone, including ourselves, as blameless and guiltless. As each of us moves towards the single goal of achieving peace of mind for ourselves, we can also experience the joining of our minds that results from the removal of the blocks to our awareness of Love's presence. John McCain's concession speech exemplified some of these ideals. I don't know whether McCain ever truly believed the fears that he and his cohorts were trying so hard to instill in the minds and hearts of the American people, but he certainly did his best to let these go - and urge his supporters to do so - during his speech. In a contest as long and difficult as this campaign has been, [Obama's] success alone commands my respect for his ability and perseverance. But that he managed to do so by inspiring the hopes of so many millions of Americans who had once wrongly believed that they had little at stake or little influence in the election of an American president is something I deeply admire and commend him for achieving. Barack Obama's victory speech also emphasized love - through the of language of hopes, dreams and unity - over fear, despair and divisiveness. The other song was triggered by a line in Obama's speech: "It's been a long time coming, but tonight, because of what we did on this date in this election at this defining moment change has come to America." The music of Crosby, Stills, Nash & Young inspires me more than the music of any other band. As I noted in my review of a CSNY concert in 2006, their song, Long Time Gone, is a "goosebump" song, and one of my favorite songs of all time. That surely, surely, surely won't stand the light of day. I've written about another verse, "But you know, the darkest hour, Is always just before the dawn", in another post (The Darkest Hour) in another, far less celebratory context, in which the song offered an unexpected catharsis. Although I invoke it again here, in a truly celebratory context, I will also note that the song was written in response to the assassination of Robert F. Kennedy, an event which many, including myself, see as the end of an earlier era of extraordinary hope. Listening to NPR this morning, a commentartor noted that Obama's promise that "we as a people will get there" invokes the spirit - and hopes and dreams - of Dr. Martin Luther King, Jr., from King's inspiring "I've been to the mountaintop" speech ... the one he gave on the eve of his assassination. The increasingly incendiary invective incited by the McCain / Palin campaign instill me with fear that Obama may meet a fate similar to other inspiring political figures from our naton's past. On this week's pledge week installment of This American Life, host Ira Glass played a segment from a Fresh Air earlier this year on Pete Hamill Remembers Robert Kennedy. I was deeply moved by Robert F. Kennedy's speech in Indianapolis the night that Martin Luther King was shot in Memphis, in which he raised the questions of "what kind of nation we are, and what kind of direction we want to move in". Many of those hearing the speech at the time were also moved: although there were riots in 180 American cities that night, there was relative quiet in Indianapolis. What kind of nation are we, and what kind of direction do we want to move in? I believe the election of Barack Obama on Tuesday represents the beginning - or perhaps the continuation - of a hopeful answer to these vitally important questions, and I hope that we, the people, can collectively let go of our fears, and our politics of divisiveness, and embrace the love and courage that will be required for us to climb the mountain toward a more perfect union. 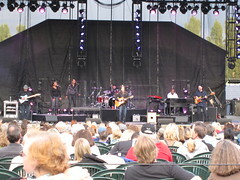 James Taylor and his Band of Legends gave a great performance at Chateau Ste. Michelle Monday night. I was particularly impressed with the harmonies provided by his backup vocalists and the rhythm laid down by his bassist, drummer and percussionist, but the entire band was strong ... one might even say "legendary". The legendary JT himself still has plenty of energy and a full vocal range (unlike some other aging performers we've seen in concerts at CSM). And as with other CSM concerts we've attended, the weather was perfect, the setting was beautiful, the food and wine was very good - I enjoyed a tomato basil sausage from The Frankfurter (Amy thought the skin on her Southwestern sausage was a little tough), and we particularly liked the 2006 Chateau Ste. Michelle Cinsault - and the music was enjoyable. However, as with most of the concerts we see there, the music was not quite as good as I'd hoped. The music was very good - Amy thought it was great - it just didn't move me the way I'd anticipated ("something in the way she moves..."). Many of James Taylor's early songs rate high on my "goose bump" scale, and he did play a few of these songs (Country Road, Mexico, Shower the People, Carolina on my Mind, Your Smiling Face), but most of the songs he played (13 of 25, by my count) - were other people's music. Now, some of these cover songs are also among my favorite JT hits - e.g., You've Got a Friend (written by Carole King, who made a surprise appearance at his July 4 concert and 60th birthday celebration at Tanglewood, where we'd seen him play around the time of his 40th birthday) and Everyday (by Buddy Holly). And, of course, "covering"often works both ways: Steamroller Blues, a JT song, was also recorded by Elvis Presley ... who did not make a surprise appearance on this tour (as far as I know). In any case, the performances on all the songs - originals and covers - were great, it's just that I generally connect more deeply on an emotional level with the JT originals. As Taylor noted in his introduction to You've Got a Friend, he started performing the song while he and Carole King were both starting out sharing a stage - and a backup band - at the legendary Troubador club in Los Angeles, after he figured it out on guitar (she performs it on piano), but "little did I know that I'd be singing it every night for the next 40 years". He noted that there are far worse "prison sentences" ... but his comment did help provide some context for why he may be performing more of other people's music as time goes by. Meanwhile, I still have my old JT CDs - and I suppose I can get a copy of One Man Band, his new CD of his old music (performed live) - if / when I want to walk on down a country road memory lane. A number of people came away from the concert with more concrete memories. During the first set, JT autographed someone's guitar between songs, and during the intermission, it looked like he was signing album covers, CD jackets, T-shirts, at least one other guitar, and other assorted writing surfaces. The second set had a larger proportion of JT originals, so I was warming up as the outside temperature cooled down (though it was not nearly as cold as the people who attended his second show at CSM last night). However, unlike the recent Indigo Girls concert we attended at Woodland Park Zoo, where they invited the audience to sing along - on the third verses (!) - of several of their songs, JT missed many opportunities to engage the audience in a sing along ... though many of us in the audience were singing along loud and clear on his classics anyway. He finally invited us to sing along at the end of the encore set, on How Sweet It Is (To Be Loved By You). All in all, it was a nice evening. We bought reserved seats rather than lawn seats, in large part due to the fact that we got the last two tickets left for either show 45 minutes after they went on sale (and there were no general admission tickets). But we were already considering the reserved seats due to a bad experience on the lawn at Tanglewood the last time we saw him, about 20 years ago, where we were seated next to a bunch of people who seemed more interested in conversation than music appreciation. This time, we got to appreciate the music more directly ... I just wish there'd been more of his music to appreciate. The Indigo Girls gave a concert Sunday night at Woodland Park Zoo's Zoo Tunes 2008 Concert Series that was, note for note, the finest music I've ever seen and heard live. I've attended - and reviewed - a fair number of other great concerts, but all of them have had at least one relative "low spot": one or more songs that just don't inspire or otherwise positively affect me (such low spots, of course, open up opportunities for bio breaks, of course). Last night's concert was just one, long, uplifting set, with no dips whatsoever ... which was fortunate, as I'd heard that lines for the honey buckets can get long at the Zoo Tunes concerts. 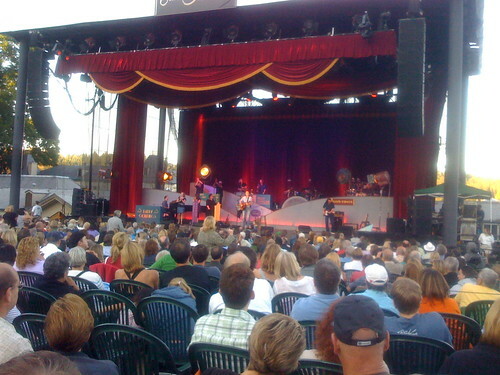 The concert was held on the closing day of Seattle PrideFest, and while it was not an official part of that event, it was clear that a large proportion of the audience was made up of gay and lesbian fans. I have a vague recollection of hearing / reading something about Amy Ray and/or Emily Saliers being lesbians, but I guess that sort of thing just doesn't matter to me - connection and alignment with spiritual and/or political views matters far more than sexual preferences, and I was reminded throughout the concert just how strong of an alignment I feel toward the music of the Indigo Girls. I'm embarrassed to admit that while I've long been a fan of the Indigo Girls, and I recognized most of the songs they played, I didn't know the names of many of their songs (I scratched a few notes on what sounded like key lyrics in each song, and was able to search out the titles in composing the set list below). The rest of the audience, though, clearly knew the lyrics to many of these songs. I was initially surprised at the audacity of inviting the audience to sing along on the third verses (vs. choruses) of at least three songs - how many people know the third verse to, say, America the Beautiful - but the Indigo Girls clearly know their audience, and their audience knows them, as people were singing along loud and strong. I'm also embarrassed to admit that I hadn't listened closely to many of their songs, but given the opportunity of a warm summer evening to relax and listen attentively, the "goose bumps" were flowing with every song (most significantly during "Galileo" and "Closer to Fine"). I have always enjoyed their music, but in the setting of the concert, I found deep, emotional resonance with nearly all of their lyrics. It dawned on me that by the time the band was producing commercial albums (1988), I had become more immersed in my "professional" vocation - I was a professor of computer science while in grad school to get my Ph.D. in the field - and less attentive to the domain of my early vocation - leader, lead guitarist and songwriter in a band I formed while in high school (two of whose five members are no longer alive). Thus my "use" of music had largely shifted from being a primary focus of attention to a background accompaniment as I read, thought about, taught about, and wrote code for and papers on technology projects. I don't foresee a big shift [back] in the near future, but I have been feeling a growing reconnection with my musical roots over the past several months, since joining Strands. Getting back to the concert, Coyote Grace opened for the Indigo Girls, playing a great folksy bluegrass set to warm things up. Unfortunately, Amy (my wife) and I were in the beer garden for most of their 45-minute set, and with a cup of beer in my hand, I did not take any notes on their songs. However, when we got back to our blanket, just before they finished, I was surprised to hear one of the main duo, Joe Stevens, say something about "when I was a young girl" during an introduction to a song. Fortunately, I had my iPhone with me, so I opened up my Safari browser, googled "coyote grace" and read about their tag line - "Girl meets Girl. Girl becomes Boy. Girl and Boy become a band." - and further on, about how Joe is a "transman" (a term I hadn't read or heard before, but could instantly understand given the context). Brandi Carlile, who has been touring with the Indigo Girls, made several appearances throughout the show, and her entire band, along with Coyote Grace, came out to join the Indigo Girls for their final few songs. Amy and I'd seen her play at Chateau Ste. Michelle a year or two ago, and enjoy her music (though not as much a the Indigo Girls ... and, to be honest, not as much as we enjoyed Coyote Grace, either). I'm not sure why Coyote Grace was the opening act for this particular show - perhaps something about it being PrideFest? - but we were glad to have the opportunity to enjoy some exposure to some great new music. Before closing with the set list, I wanted to share a few tips for anyone considering attending a concert at Woodland Park Zoo. We parked in the south lot (off NE 50th Street, just west of Stone Way). Parking was easy - in and out - but it was a long walk to the concert grounds, which is at the north end of the zoo grounds. We lined up at 4:00 at the south gate, and were probably among the first 20 people in line. However we did not get very close to the stage, so next time, we'll try parking - and lining up - near the north gate or west gate. We set up near some shade near the back, but the shade shifted ... and we were sitting near a number of people who seemed more interested in talking with each other rather than enjoying the music (as a primary focus of attention). Next time we'll try getting close to the stage and forego the prospect of shade ... and I'm really glad that we have premium seats for the upcoming James Taylor show (one of our worst concert experiences was trying to listen to James Taylor at Tanglewood in the early 80s amid all the gabbing people who paid general admission for a nice summer evening picnic that just happened to have a live performance nearby). Speaking of James Taylor - who we'll be seeing at Chateau Ste. Michelle in a few weeks - reminds me of one more thing I wanted to mention: rock stars, and how well they "age". We've seen James Taylor three times over the past 25 years, and he has put on fabulous concerts every time. In contrast, we were rather disappointed in the Crosby, Stills and Nash (CSN) concert at Chateau Ste. Michelle in 2004: the vocal range of all three had diminished considerably over time - especially Stephen Stills, still one of my guitar heroes - as had their energy ... and ability to energize me. Fortunately, though, when we saw Crosby, Stills, Nash and Young (CSNY) at White River Amphitheatre last year, the addition of Neil Young was a tremendous energy boost, and that concert was great. There was no visible or audible signs of "wear" in the Indigo Girls - they still have full vocal range and lots of energy ... although they have only been performing (in the large) for half as long as either Taylor or CSN[Y]. One thing I was rather surprised at, though, was the relative absence of politics throughout the concert. The CSNY concert last year was very political - almost uncomfortably so (but I think that was their goal) - and I would have thought the Indigo Girls might also use their podium to promote political causes. They did promote a couple of "get out the vote" organizations, but other than that, they just played their music. We did see a cardboard life-size figure of Barack Obama being carried into the concert, but there were no endorsements of candidates - or causes - during the concert. I suspect that there were few registered Republicans at the concert, and given that the Democratic Party primary is over, perhaps they figured there's no sense preaching to the choir. I do have the audacity to hope, though, that this rather apolitical appearance does not reflect apathy among these voters. 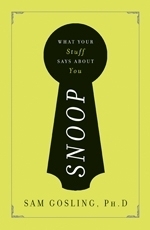 Sam Gosling's new book - Snoop: What Your Stuff Says About You - blends an engaging and accessible overview of some of the key concepts and research findings in personality psychology and environmental psychology with what amounts to a collection of short detective stories. Snoopology, the art and science of determining "which of your tastes and habits provide particular portals into your personality", attempts to differentiate what our stuff really says about us from what most people might think our stuff says about us. Openness: Leonardo da Vinci; creative, imaginative, abstract, curious, deep thinkers, inventive and value arts and aesthetic experiences. Conscientiousness: RoboCop; thorough, dependable, reliable, hard-working, task-focused, efficient, good planners. Extraversion: Axel Foley (Beverly Hills Cop); talkative, energetic, enthusiastic, assertive, outgoing, sociable. Agreeableness: Fred Rogers; helpful, selfless, sympathetic, kind, forgiving, trusting, considerate, cooperative. Neuroticism: Woody Allen; anxious, easily ruffled or upset, worried, moody. The "sharing game" reminds me of OneKeyAway, a dating service that adds some new twists to "lock-and-key" parties, in which women are given locks and men are given keys - both worn on lanyards around their necks - and prizes are awarded to couples who find matching locks and keys, offering incentives to both easily engage and disengage throughout the course of a party. I've written an entire blog post about lock-and-key parties and OneKeyAway; here I'll simply note a few relevant items. OneKeyAway introduces two interesting dimensions: a 64-question online questionnaire, which covers topics such as relationship expectations, emotional responsiveness, personal behaviors and habits, hobbies, sexual orientation and preferences, religion and substance; and a MatchLinC keyfob-like device that encodes those responses and is handed out at an event. Participants can "zap" each other - point their MatchLinCs at each other and press a button (vs. inserting a key in a lock), and a red, amber or green light on the device signals their relative compatibility. Couples can, of course, strike up a conversation whether the devices say they are compatible or incompatible (both of which are potentially interesting conversation topics if they find each other attractive). The real power is in the questionnaire, which primes the participants to delve into topic areas that are more likely to lead to progressive disclosure and increasing levels of intimacy. music consistently trumps books, clothing, food, memories and television shows in helping people get to know each other. Web sites are extraordinarily good places to learn about people - perhaps the best of all places. The book includes a handy table (shown right) to indicate just how well we can really learn about people's personality traits through different channels. These, in turn, reminded me of some earlier ruminations about music and personality, that were inspired by earlier encounters with the work of Sam and his colleagues, and gives me renewed hope that we'll be able to effectively transmute Strands' early core competencies in music recommendation into broader and deeper recommendations that help people discover and enjoy other people, places and things around them (an explicit part of our mini-manifesto for Strands Labs, Seattle). The sharing game, OneKeyAway and talking about music preferences can help people move from traits to personal concerns, but to really enable people to know each other at the deeper level of identity, McAdams says we have to set the stage for the telling of a story ... their story: "an inner story of the self that integrates the reconstructed past, perceived present and anticipated future to provide a life with unity, purpose and meaning". This dimension reminds me of my experience in The Mankind Project, where we regularly seek to differentiate data, judgments, feelings and wants. One of the tools we use to do this is careful use of language, or as we like to put it, clear, direct, concise and truthful (CDCT) communication. We often preface our remarks with "the story I make up about X" to help us remember that the judgments we have about people - others and ourselves - typically take the form of narratives we construct based on relatively sparse data, filled in with a multitude of judgments, in our relentless effort to make sense of the world. We also emphasize the use of "I" statements - which is consistent with the findings of James Pennebaker reported in the book that a person's use of first-person pronouns is correlated with honesty (and, interestingly, complex thinking). Returning to the topic of making sense of people, Gosling reports that the famous Rorschach ink-blot test, in which people describe what they see in ink-blot patterns, is actually not very helpful in assessing personality. A more helpful test is the Picture Story Exercise (PSE) - or Thematic Apperception Test (TAT) - in which people make up a spontaneous story about a random series of pictures, revealing repressed aspects of their personality, especially their motivations and needs for achievement, affiliation and power. Personality seepage can also be effectively captured and analyzed through body movements such as jumping, walking and dancing. Wryly noting that "we sometimes say more with our hips than with our lips", Sam reports on a study by Karl Grammer, at the Ludwig-Boltzmann Institute for Urban Ethology, in which analysis of videotapes and interviews conducted in nightclubs showed that the tightness of a woman's clothing, the amount of skin it reveals, and the "explosiveness" of her movement on the dance floor are all correlated to estrogen levels (indicating fertility, and thus, attractiveness, evolutionarily speaking). Of course, physiological components of attractiveness are often combined with - or covered up or compensated by - other, more deceptive, dimensions of the outer layers of appearance and behavior we project. This reminds me of some of Judith Donath's insights into the application of signaling theory to social networks, in which she distinguishes among the relative costs and benefits of handicap signals, index signals and conventional signals, and explores how fashion is largely a manifestation of the latter, relatively inexpensive, type of signal. Fortunately, however, for those of us who are concerned or obsessed with authenticity, Sam claims that our behavioral residue is difficult to consciously manipulate, and underneath whatever appearances we may try to cultivate, our real personalities persistently try to express themselves. This is corroborated by experimental results from Self-Verification Theory, which suggests that people want to be seen as they really are (or at least as they see themselves), even if that means that "negative" aspects of their personalities are seen. One of the more controversial chapters in the book addresses the issue of stereotypes. Given that we can only perceive narrow aspects of others' personalities, we naturally tend to fill in the gaps of the stories we make up about them with information based on our perceptions others who we judge similar, based on gender, race, or where they live (e.g., with respect to red states and blue states). Unfortunately, for those of politically correct persuasion, many of these stereotypes do have at least a kernel of truth. For example, women tend to score higher in the Big Five trait of neuroticism than men, i.e., they tend to be more anxious, less even-tempered, less laid-back, more emotional and more easily stressed tan men, and it turns out that, generally speaking, conservatives are "neurologically more resistant to change" and liberals are more extroverted. And music stereotypes turn out to be very helpful in forming correct impressions of people, although not all music genres are created equal, with respect to the personality traits their fans inadvertently reveal. For example, affinity for Contemporary Religious music turns out to be much more revealing about personality, values and alcohol and drug use than a love of Soul music or, more surprisingly to me, Rap. 1.4 Million: Americans who suffer from hoarding or clutter. 80: Percentage of things Americans own that they never use. Unfortunately, it's not clear what proportion of the 1.4 million sufferers are the actual hoarders and how many are family, friends and/or coworkers of the hoarders ... for example, I think my wife suffers much more from my hoarding than I do. I can’t help but pay special attention to the songs that randomly pop into my head. ... Music has the magical ability to transport and transform us in ways that impress me on a daily basis. I've just finished - and plan to write another long blog post about - another fabulous book: This is Your Brain On Music: The Science of a Human Obsession, by Daniel Levitin ... in which he talks about how and why some music gets stuck in our heads ... and a variety other aspects of our obsession with music ... and which offers an interesting complement to some of the insights that Sam shares in his book. Attractive people may be treated differently in social interaction, a phenomena that actually leads to differences in how they behave and how they seem themselves. The sound of any woman's voice on the telephone tells us whether the speaker is attractive. It reflects back as self-confidence, natural ease and self-attention all the admiring and desirous glances she has ever received. I don't mean to say that personality and social psychology does not yield many interesting interesting insights - indeed, Sam's book is one of the most interesting books I've ever read - I just wonder how much impact these insights will have on society. How much does what our behavior really mean matter, in comparison to how others interpret our behavior (and its residue)? Should we be doing more scientific experiments or conducting more polls? Would we rather be right or happy (or popular)? Of course, if snoopology catches on, perhaps more of us can be right, happy and popular - about and with each other.